C-SPAN Caller Threatens To Kill CNN's Don Lemon And Brian Stelter: If I See Them, I'm Going To Shoot Them - Joe.My.God. 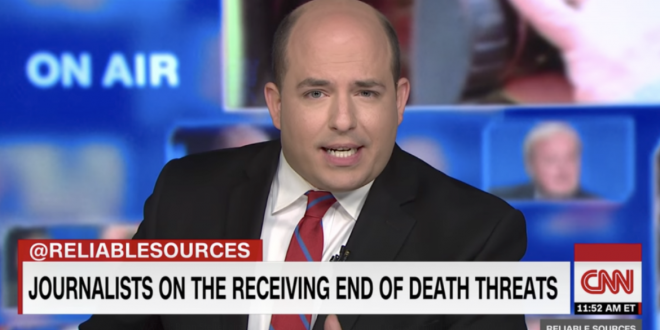 At the end of his broadcast Sunday, Reliable Sources host Brian Stelter pointed out that threats against reporters are on the rise before noting that a C-SPAN caller on Friday threatened to shoot him and CNN anchor Don Lemon. Stelter went on to play the clip, which featured a man supporting the president’s criticism of the media because he claimed that Stelter and Lemon had called all Trump voters racist. The CNN senior media correspondent noted neither he or Lemon said that before airing the last part of the call. Here’s the clip of that @cspanwj caller saying he’s “going to shoot” Brian Stelter and Don Lemon if he sees them.